A prehistoric necropolis yields clues to the ancient use of sound and its effect on human brain activity. During testing, a deep male voice tuned to these frequencies stimulated a resonance phenomenon throughout the hypogeum, creating bone-chilling effects. It was reported that sounds echoed for up to 8 seconds. Archaeologist Fernando Coimbra said that he felt the sound crossing his body at high speed, leaving a sensation of relaxation. When it was repeated, the sensation returned and he also had the illusion that the sound was reflected from his body to the ancient red ochre paintings on the walls. One can only imagine the experience in antiquity: standing in what must have been somewhat odorous dark and listening to ritual chant while low light flickered over the bones of one's departed loved ones. In the publication from the conference on Archaeoacoustics which sparked the study, Dr. Paolo Debertolis reports on tests conducted at the Clinical Neurophysiology Unit at the University of Trieste in Italy: "…each volunteer has their own individual frequency of activation, …always between 90 and 120 hz. Those volunteers with a frontal lobe prevalence during the testing received ideas and thoughts similar to what happens during meditation, whilst those with occipital lobe prevalence visualized images." He goes on to state that under the right circumstances, "Ancient populations were able to obtain different states of consciousness without the use of drugs or other chemical substances." Writing jointly, Anthropologist, Dr. Ezra Zubrow, Archaeologist and Psychologist, Dr. Torill Lindstrom state: "We regard it as almost inevitable that people in the Neolithic past in Malta discovered the acoustic effects of the Hypogeum, and experienced them as extraordinary, strange, perhaps even as weird and "otherworldly". Project organizer Linda Eneix points to other features: "The carving of the two niches which concentrate the effect of sound, the curved shape of the Oracle Chamber with its shallow "shelf" cut high across the back, the corbelled ceilings and concave walls in the finer rooms are all precursors of todays' acoustically engineered performance environments." She says, "If we can accept that these developments were not by accident, then it's clear that Ħal Saflieni's builders knew how to manipulate a desired human psychological and physiological experience, whether they could explain it or not." 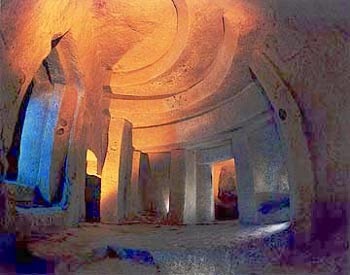 In the same conference publication Emeritus Professor Iegor Reznikoff suggests that Ħal Saflieni is a link between Palaeolithic painted caves and Romanesque chapels … "That people sang laments or prayers for the dead in the Hypogeum is certain, for a) it is a universal practice in all oral traditions we know, b) at the same period, around 3,000 BC, we have the Sumerian or Egyptian inscriptions mentioning singing to the Invisible, particularly in relationship with death and Second Life, and finally c) the resonance is so strong in the Hypogeum already when simply speaking, that one is forced to use it and singing becomes natural." Drs. Lindstrom and Zubrow hint at a more hierarchal purpose for the manipulation of sound. "The Neolithic itself was characterized by cultures focused on new invention…enormous collective collaborations over extended periods of time. For these large-scale projects of agriculture and building, social cohesion and compliance was absolutely necessary." The same people who created Ħal Saflieni also engineered a complete solar calendar with solstice and equinox sunrise alignments that still function today in one of their above-ground megalithic structures. There is no question that a sophisticated school of architectural, astronomic and audiologic knowledge was already in place a thousand years before the Egyptians started building pyramids. 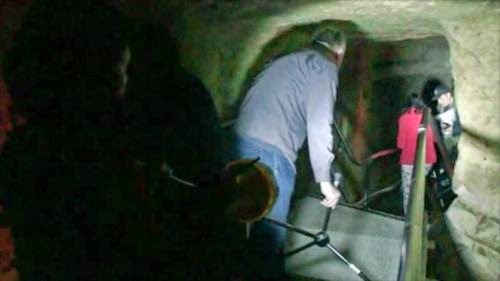 Eneix believes that Malta's Ħal Saflieni Hypogeum is a remnant of a rich cultural tradition carried by the Neolithic migrations that spanned thousands of years and thousands of miles.